Dr David Dorsey claims the developer ( Union Properties Dubai) misrepresented the quality of the project and breached a promise to provide a swimming pool and health club. “The whole point of the DIFC is it offers the protection of international legal standards,” Dr Dorsey said. The SPA was necessary to “give us the ability to guard our rights”, Dr Dorsey said. “All we had was a one-page reservation form for three years.” Union Properties did not offer a detailed SPA until July last year and included many clauses “unilaterally advantageous” to the developer, the suit claims. The language addressed such issues as liability, force majeure and penalties not in the original agreement, the suit claims.Dr Dorsey refused to sign it. This entry was posted on July 28, 2011 at 02:06	and is filed under Developer Dubai, Dubai Legal - Real Estate Lawsuits, Dubai Property owner, Dubai Real Estate Scandal. 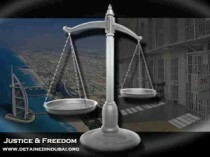 Tagged: Dubei Property Lawsuit, union properties dubai. You can follow any responses to this entry through the RSS 2.0 feed. Both comments and pings are currently closed.